I love Phi Sig, PHI SIGMA!!!" Phi Sigma Sigma was founded by a unique group of women at Hunter College in New York, New York. Our founders, Lillian Gordon, Ethel Gordon, Josephine Ellison, Shirley Cohen, Fay Chertkoff, Claire Wunder, Estelle Melnick, Rose Sher, Jeanette Lipka, and Gwen “Rae” Zaliels, each shared a vision to begin a sorority committed to sisterhood, scholarship, and selfless giving. Phi Sig expanded to many other college campuses and now consists of over 110 active chapers all around the United States and Canada. 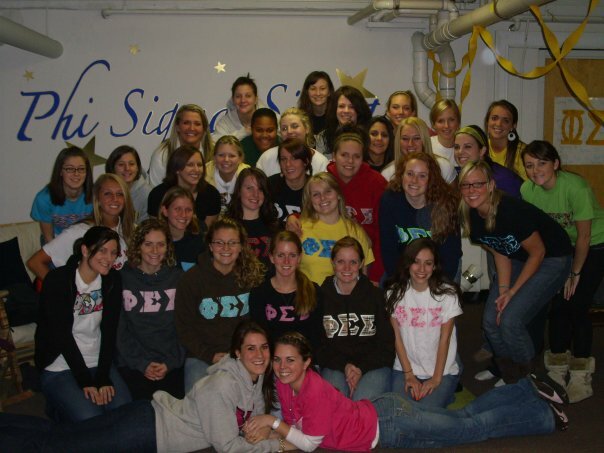 Our Chapter, Gamma Psi was founded at McDaniel College after Sigma Sigma Tau became Phi Sigma Sigma on February 8, 1981. Questions or Comments about our site? Contact: Kendall Fielding at kef005@mcdaniel.edu. Philanthropy is a very important aspect of Phi Sigma Sigma. At a national level, Phi Sigma Sigma works along side with the National Kidney Foundation. Our chapter also contributes to various local philanthropies. We invite you to visit us or attend an event. Our members are more than happy to answer any questions you may have about the organization and how you can join. Recruitment is going on right now so make sure you sign up! !